A good ornithologist should be able to distinguish birds by their air as well as by their colors and shape; on the ground as well as on the wing, and in the bush as well as in the hand. For, though it must not be said that every species of birds has a manner peculiar to itself, yet there is somewhat, in most genera at least, that at first sight discriminates them and enables a judicious observer to pronounce upon them with some certainty. Letter (7 Aug 1778) to Daines Barrington, collected in The Natural History of Selborne (1829), 274. Botany is based on fixed genera. Philosophia Botanica (1751), aphorism 209. Trans. Frans A. Stafleu, Linnaeus and the Linnaeans: The Spreading of their Ideas in Systematic Botany, 1735-1789 (1971), 64. Fortunately Nature herself seems to have prepared for us the means of supplying that want which arises from the impossibility of making certain experiments on living bodies. The different classes of animals exhibit almost all the possible combinations of organs: we find them united, two and two, three and three, and in all proportions; while at the same time it may be said that there is no organ of which some class or some genus is not deprived. A careful examination of the effects which result from these unions and privations is therefore sufficient to enable us to form probable conclusions respecting the nature and use of each organ, or form of organ. In the same manner we may proceed to ascertain the use of the different parts of the same organ, and to discover those which are essential, and separate them from those which are only accessory. It is sufficient to trace the organ through all the classes which possess it, and to examine what parts constantly exist, and what change is produced in the respective functions of the organ, by the absence of those parts which are wanting in certain classes. Letter to Jean Claude Mertrud. In Lectures on Comparative Anatomy (1802), Vol. I, xxiii--xxiv. I believe that life can go on forever. It takes a million years to evolve a new species, ten million for a new genus, one hundred million for a class, a billion for a phylum—and that’s usually as far as your imagination goes. In a billion years, it seems, intelligent life might be as different from humans as humans are from insects. But what would happen in another ten billion years? It’s utterly impossible to conceive of ourselves changing as drastically as that, over and over again. All you can say is, on that kind of time scale the material form that life would take is completely open. To change from a human being to a cloud may seem a big order, but it’s the kind of change you’d expect over billions of years. Quoted in Omni (1986), 8, 38. It is curious to observe with what different degrees of architectonic skill Providence has endowed birds of the same genus, and so nearly correspondent in their general mode of life! for while the swallow and the house-martin discover the greatest address in raising and securely fixing crusts or shells of loam as cunabula for their young, the bank-martin terebrates a round and regular hole in the sand or earth, which is serpentine, horizontal, and about two feet deep. At the inner end of this burrow does this bird deposit, in a good degree of safety, her rude nest, consisting of fine grasses and feathers, usually goose-feathers, very inartificially laid together. In Letter to Daines Barrington, (26 Feb 1774), in The Natural History and Antiquities of Selborne (1789), 176. Nature proceeds little by little from things lifeless to animal life in such a way that it is impossible to determine the exact line of demarcation, nor on which side thereof an intermediate form should lie. Thus, next after lifeless things comes the plant, and of plants one will differ from another as to its amount of apparent vitality; and, in a word, the whole genus of plants, whilst it is devoid of life as compared with an animal, is endowed with life as compared with other corporeal entities. Indeed, as we just remarked, there is observed in plants a continuous scale of ascent towards the animal. So, in the sea, there are certain objects concerning which one would be at a loss to determine whether they be animal or vegetable. For instance, certain of these objects are fairly rooted, and in several cases perish if detached. History of Animals, 588b, 4-14. In Jonathan Barnes (ed.) The Complete Works of Aristotle (1984), Vol. 1, 922. Nature progresses by unknown gradations and consequently does not submit to our absolute division when passing by imperceptible nuances, from one species to another and often from one genus to another. Inevitably there are a great number of equivocal species and in-between specimens that one does not know where to place and which throw our general systems into turmoil. Jean Piveteau (ed. ), Oeuvres Philosophiques de Buffon (1965), 10. Trans. in Paul Farber, 'Buffon and the Concept of Species', in Journal of the History of Biology, 1972, 5, 260. 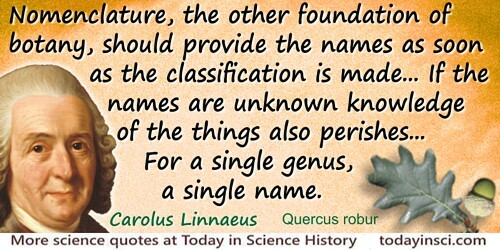 Nomenclature, the other foundation of botany, should provide the names as soon as the classification is made... If the names are unknown knowledge of the things also perishes... For a single genus, a single name. Philosophia Botanica (1751), aphorism 210. Trans. Frans A. Stafleu, Linnaeus and the Linnaeans: The Spreading of their Ideas in Systematic Botany, 1735-1789 (1971), 80. Scientists and Drapers. Why should the botanist, geologist or other-ist give himself such airs over the draper’s assistant? Is it because he names his plants or specimens with Latin names and divides them into genera and species, whereas the draper does not formulate his classifications, or at any rate only uses his mother tongue when he does? Yet how like the sub-divisions of textile life are to those of the animal and vegetable kingdoms! A few great families—cotton, linen, hempen, woollen, silk, mohair, alpaca—into what an infinite variety of genera and species do not these great families subdivide themselves? And does it take less labour, with less intelligence, to master all these and to acquire familiarity with their various habits, habitats and prices than it does to master the details of any other great branch of science? I do not know. But when I think of Shoolbred’s on the one hand and, say, the ornithological collections of the British Museum upon the other, I feel as though it would take me less trouble to master the second than the first. Samuel Butler, Henry Festing Jones (ed. ), The Note-Books of Samuel Butler (1917), 218. The chemical differences among various species and genera of animals and plants are certainly as significant for the history of their origins as the differences in form. If we could define clearly the differences in molecular constitution and functions of different kinds of organisms, there would be possible a more illuminating and deeper understanding of question of the evolutionary reactions of organisms than could ever be expected from morphological considerations. 'Uber das Vorkommen von Haemoglobin in den Muskeln der Mollusken und die Verbreitung desselben in den lebenden Organismen', Pflügers Archiv für die gesamte Physiologie des Menschen und der Tiere, 1871, 4, 318-9. Trans. Joseph S. Fruton, Proteins, Enzymes, Genes: The Interplay of Chemistry and Biology (1999), 270. The modern system of elevating every minor group, however trifling the characters by which it is distinguished, to the rank of genus, evinces, we think, a want of appreciation of the true value of classification. The genus is the group which, in consequence of our system of nomenclature, is kept most prominently before the mind, and which has therefore most importance attached to it ... The rashness of some botanists is productive of still more detrimental effects to the science in the case of species; for though a beginner may pause before venturing to institute a genus, it rarely enters into his head to hesitate before proposing a new species. (With Thomas Thomson) Flora Indica: A Systematic Account of the Plants of British India (1855),10-11. The names of the plants ought to be stable [certa], consequently they should be given to stable genera. Philosophia Botanica (1751), aphorism 151. Trans. Frans A. Stafleu, Linnaeus and the Linnaeans: The Spreading of their Ideas in Systematic Botany, 1735-1789 (1971), 57. We admit as many genera as there are different groups of natural species of which the fructification has the same structure. Fundamenta Botanica (1736), 159. Trans. Gunnar Eriksson, 'Linnaeus the Botanist', in Tore Frängsmyr (ed. ), Linnaeus: The Man and his Work (1983), 86. Yet man does recognise himself [as an animal]. But I ask you and the whole world for a generic differentia between man and ape which conforms to the principles of natural history, I certainly know of none... If I were to call man ape or vice versa, I should bring down all the theologians on my head. But perhaps I should still do it according to the rules of science. Letter to Johann Gmelon (14 Jan 1747), quoted in Mary Gribbin, Flower Hunters (2008), 56.